Chilworth Hall is a Gold Associate of Moviola, one of the largest rural film schemes in Europe. This charity started in 2001, has national reach and is growing fast. 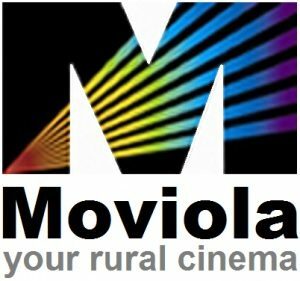 At the time of writing, Moviola supports well over 200 venues. Chilworth Hall’s new AV system (5,500-lumen projector, 3-metre screen and powered speakers) makes it an ideal place to show the latest movies. Chilworth Moviola’s seasons are currently expected to run from Autumn through to Spring, although if demand is sufficient there is no reason why they cannot be extended to be monthly throughout the year. The programme page will show all planned dates and film synopses. Tickets will be available exclusively through Eventbrite (via links on the programme page). You may pay online or, if you prefer, print your ticket and use it to pay at the door. Please note that a pre-reserved ticket is required for admission, however you choose to pay. The price is £5 per person. Moviegoers will be welcome to bring their own refreshments, but tea/coffee and snacks including popcorn will be available from the hatch. There will be no temporary licence, but BYOB* is perfectly welcome. Movies will normally be shown in the evening, although some matinee performances with films suitable for children and families will be scheduled during the season, perhaps during school holidays. Unless otherwise noted, doors (and the kitchen hatch) will normally open at 7pm, with the screening starting with trailers at 7.30pm.